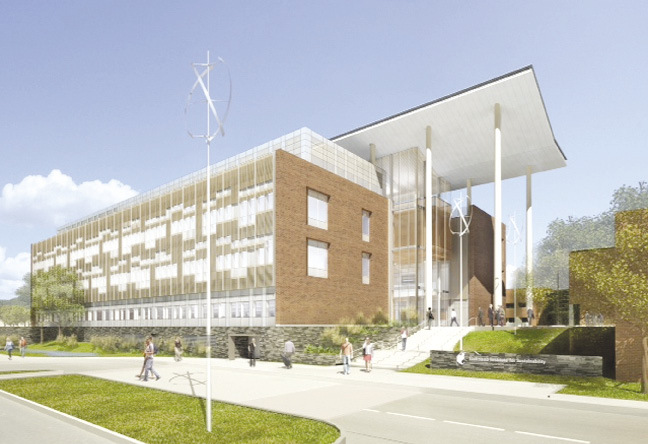 Rendering of the Golisano Institute for Sustainability on the campus of RIT, Rochester. Shown (from left) at the ground breaking of the Golisano Institute for Sustainability are: Judson, Goodrich, Nasr, Fiotes, Destler, Duffy, Morelle, Robach, Parker, Brooks, and Ryen. 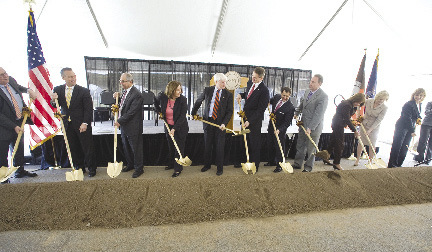 A groundbreaking ceremony was held for the Golisano Institute for Sustainability on the campus of Rochester Institute of Technology (RIT), a world-renowned university that improves sustainable processes and is a beacon for innovation. Designed by FXFOWLE in collaboration with SWBR, the new 70,000 s/f building is a living laboratory for the research and development of sustainable industrial processes and building systems. 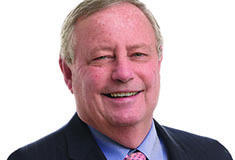 LeChase Construction Co. is the design-build team leader for the $38 million project. Lab spaceâ€”the main component of the facilityâ€”will provide users with necessary space to research how to improve the process of manufacturing and "remanufacturing," and will be equipped with the capabilities for experimentation, testing, and prototype manufacturing. 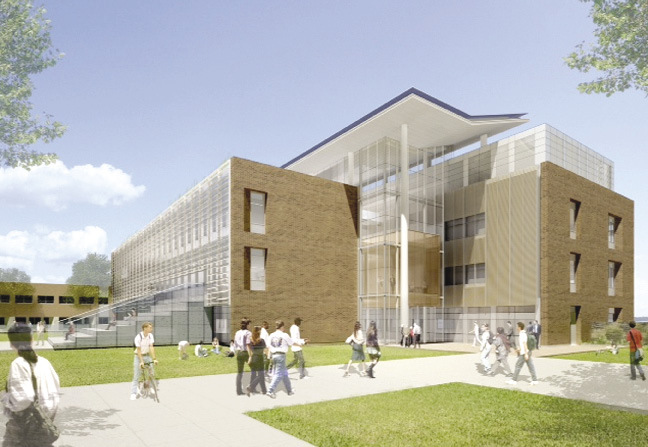 In addition to housing multiple labs, the building will includes classrooms and conference facilities supporting RIT's leading graduate programs in sustainable production, sustainable systems and a new School of Architecture. The groundbreaking featured a ceremonial "turning of the dirt," presentations on sustainable design and remarks by New York lieutenant governor Robert Duffy and Stella Fiotes, chief facilities management officer for the National Institute of Standards and Technology (NIST). RIT was awarded a $13.1 million grant through NIST's Construction Grant Program to build the facility and $10 million in funding from the state of New York to assist with construction. NIST's Grant Program is a peer-reviewed and highly-competitive effort so RIT is in a very select group of recipients. "We expect the Golisano Institute of Sustainability to exceed the standard for LEED Platinum certification," said Nicholas Garrison, AIA, OAQ, LEED, principal and design director at FXFOWLE. "The design seeks to create a 'living laboratory' for sustainable design practice by maximizing daylight and minimizing heat loss, integrating advanced facility monitoring systems, and a 'tempered" internal, day lit galleria from which all spaces in the building can be seen and accessed. All components of the building will be visible for users and visitors, making each space a learning space." Additional environmental initiatives include geothermal systems with heat recovery, chilled beams, active photovoltaic solar panels and wind turbines. Construction is expected to be completed in 2012. Shown (from left) at the ground breaking of the Golisano Institute for Sustainability are: Jay Judson, SWBR Architects; Bill Goodrich, LeChase Construction; Nabil Nasr, director of Golisano Institute of Sustainability; Stella Fiotes, U.S. Department of Commerce's National Institute of Standards and Technology; Bill Destler, president RIT; Bob Duffy, lieutenant governor; Joe Morelle, state assembly; Joe Robach, state senate; Sandy Parker, CEO of Rochester Business Alliance; Maggie Brooks, Monroe County executive; Erinn Ryen, RIT student.